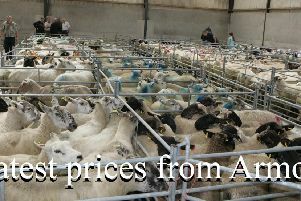 There was a good entry of sheep on Monday, April 1 at Raphoe Mart with a good trade for all stock on offer. €90 to €100 for 36-40 kgs. €100 to €120 for 40-45 kgs. €110 to €120 for 45-50 kgs. €120 to €128 for 50-58 kgs. 7 Suffolk ewe hoggets 70 kg sold for €140 each. Fat ewes sold from €60 to €140. Ewes with 1 lamb sold from €150 to €180. Ewes with 2 lambs sold from €220 to €275. Easter lamb sale will be held on Monday, April 15, 2019. Cattle sale on Thursday, April 4, 2019: Heifers sold from €2.10/kg to €3.05/kg. Bullocks sold from €2.00/kg to €2.90/kg. Bulls sold from €2.10/kg to €3.10/kg. 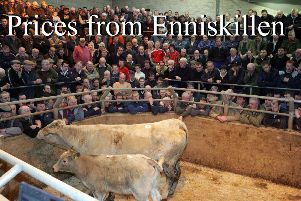 Fat cows sold from €705/head to €1,345/head. Top class bulls over 600 kgs - €600 to €660 over. Beef bullocks - €600 to €855 over. Store bullocks - €400 to €825 over. Beef heifers - €405 to €885 over. Store heifers - €350 to €790 over. A bigger entry of cattle on Thursday, April 4 at Raphoe Mart. farmer and feedlot activity around the ring. Likewise lighter stores and weanlings were up in price with farmers and agents all in competition for these - selling up to and over €3.00/kg. Raphoe Livestock Mart will hold a pedigree beef female sale on Friday, April 26, 2019 at 6.30pm. Entries welcome for all pedigree beef bred females - cows, heifers and maidens. Entry forms are available from the mart office. Entries close on Friday, April 5, 2019. Sheep sale every Monday at 11am. Cattle sale every Thursday at 11am.